In the earliest days of Delia’s career, she was asked to make a cake for a photographic shoot. 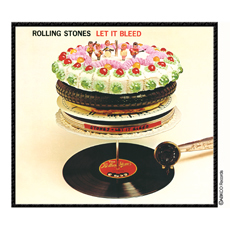 She didn’t know that it was to grace the cover of the new album, Let it Bleed, from the Rolling Stones which were, at the time, one of the world’s leading rock banks. All she was told was that it had to be ‘really gaudy’. Delia obliged, creating a cake that certainly owes nothing to minimalism with piped cream and as many glace cherries as possible, complete with figurines of the singers. She only found out what it was to be used for at the studio – which is how she came to contribute in some small way to the Sixties’ pop scene.